Do you know that Law library has the luck to house the working library of Francois Olivier-Martin (1879-1952), a renowned legal historian, author of Histoire du droit français des origines à la Révolution (1948), a monumental work, foundational to understanding of French Pre-Revolutionary Law. Olivier-Martin’s library is now part of the Wainwright Collection. Here you can find books reviews published in 2010 when Histoire du droit français … was re-printed. 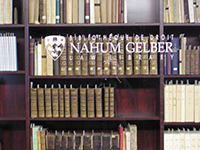 Olivier-Martin’s library contains more than 700 titles, among which you can find Manuel de l’inquisiteur (1926), an extract from original manuscript (ca. 1323) by Bernard Gui (1261 or 1262 – 1331). This is the question that we are getting sometimes from our Law students who are coming to visit us even when they are on vacation 🙂 Paradoxically, summer is the busiest time for librarians. Yes, during the summer we do not teach as much, and we do not receive as many reference inquiries as we do during the school year, but we are working on special projects, and we are going to the conferences to learn and to present results of our work or research. This summer, I began working on a special project on Wainwright collection that we house in the Law Rare Books Room. I will report my progress and the results of this project on this blog. Great news! Our darkest corner at the ground floor has received new improved lightning , so now our new study space is comfortable at any time of the day!